"Let me add my two cents worth. It's people like you who inspire and encourage people like me to get out of our comfort zones and do whatever we can to help get this country back to its basic principles. I wish there were more like you and Carol. Keep on keeping on!!!" Thanks for this message from a subscriber to ReturnToExcellence.net. Using the above as a backdrop I present two more inspirational events that Carol & I had this past week. About 8 PM Tuesday night I received a call from a man from Mike Agosta's congressional campaign who wanted to review the list of volunteers I had sent to them following Candidates' Night & my Morristown Tea Party speech. After a short conversation the man told me I could leave the information he requested @ the Agosta campaign office & he would pick it up either on weekends or after 2 PM during the week when he came to work - he assured me he would be there every day between now & November 2. After just a few questions I learned that this young man is a high school senior who is volunteering his time. 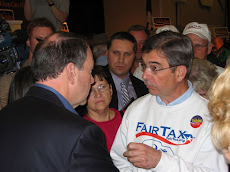 The respect that he has for Mr. Agosta is well deserved based on all of Mike's positions not just his support of the FairTax. I told the young man that I looked forward to working for his run for office one day in the future just like I am working for Mike Agosta & America now. It was a real upper. Also on Tuesday I received a call from another subscriber to ReturnToExcellence.net who let me know the results of his speech to the Franklin Township Republican Club on Monday that was attended by about 50 people. 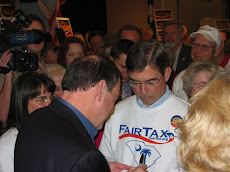 The speech was very well received but the most important point to me was not the technical information that was presented but rather was in the introduction when this first time FairTax speaker said "while I don't consider myself to be a FairTax expert I do believe it is important for me to share my strong support and passion for the FairTax." The point of the above accounts is for us not to lose by sitting on the sidelines if we have something to contribute but rather as TR challenged us "to be the man in the arena ...who strives to do the deeds, who knows the great enthusiasms, the great devotions... to dare greatly so that your place will never be with those cold & timid souls who know neither victory nor defeat." The circle was completed for Carol & me with all three of these events - the first thanking us & the other two providing inspiration for us. All three indicate the type of people we want to share our lives with. What a well deserved compliment for you and Carol! Thanks for sharing....knowing that you two are working hard in NJ inspires me to do my part in IL....tomorrow is my day to make telephone calls...some people are getting testy...others ask questions. I never know what to expect, but I plan to do my level best for the cause of taking our state back! You are so right, Doug! Jim recently wrote a letter to the editor which included a scary quote from Saul Alinsky's Rules for Radicals........"the first radical known to man who rebelled against the establishment and did it so effectively that he got his own kingdom...Lucifer." Jim went on to say what really concerns him is that our President and Sec of State both follow his teachings.